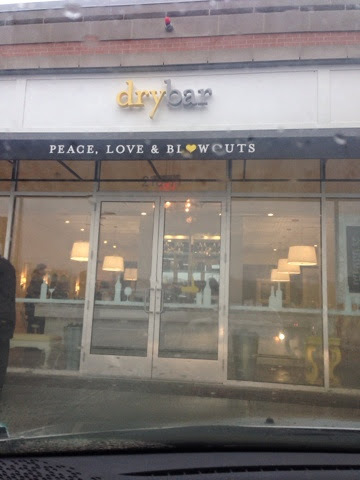 The only thing that upset me about dry bar is that I didn’t come up with this concept myself. Their marketing is creative and spot on to say the least. All blow dries are $40. No questions asked. This is the perfect place if you are going somewhere nice or if you just don’t have the time or means to blow dry and style your own hair. Their eye catching website had me at hello with their menu of services being named after cocktails, of course and the fact that you can book online on almost any 15 minute increment. The salon continued its expectations once I arrived. I was immediately greeted and my coat was taken care of, followed by my drink order which was an option of coffee, tea or water (it was a Sunday afternoon). I was told they serve big girl drinks if you have an evening appointment and mimosas in the morning. The set up was adorable, as expected. The entire salon is set up like a “bar” where you put your drink on a coaster and your feet on a metal bar that lines the floor. I had about a 10 minute wash and scrub and she spent about 30-40 minutes blowing out and styling my hair (keep in mind, I have long, wavy, sometimes frizzy hair.) She asked if I was okay with using product and then showed me what she was using and explained why she was using it. Having worked in a hair salon for many years, I am not afraid of product and usually don’t care what the stylist or salon prefer to use, but it exemplified her professional customer service by explaining because I know most people like to know what is being put on their locks! My hair came out great and I am still loving it two days later. 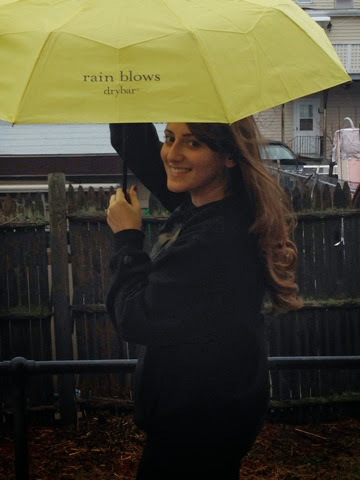 The receptionist gave me a yellow dry bar umbrella when I left because it was a rainy day. It was the cherry on top of my Shirley Temple of an appointment. You can leave gratuity on your credit card, which most salons do not allow or prefer. I grabbed some of their ads lying around – a card that looked like an iPhone informing about their Smart Phone App and a business card which was, what else, a cardboard drink coaster!